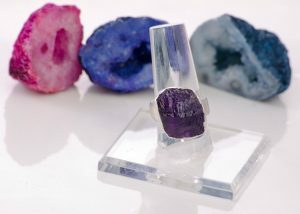 Rough cut, gemstone jewelry is a stylish choice for customers wanting something a bit different than traditionally cut, faceted gems. The combination of feminine, pastel colors and the rough texture of natural gemstones makes the perfect modern mix. Sweet, yet edgy. If you’ve shopped with us before, you know Fox Gallery is all about providing unique options and this style is right up our alley! Select styles available online or shop in-store for an even larger selection!